Ghorbash the Iron Hand is an Orc ranger and the brother of Chief Burguk. Due to his adventurous nature, he served the Legion for years but has now returned to his family in the Orc Stronghold Dushnikh Yal. He still longs for traveling and, as a result, can be convinced to become your follower. Befriending him will make him a potential candidate for marriage. Like the other residents of the stronghold, Ghorbash sleeps in Burguk's Longhouse every night between midnight and 7am. He then heads outside, pulls out his axe and hacks away on the training dummy for twelve solid hours. At 7pm he goes back inside and enjoys a five-hour meal with the other Orcs. 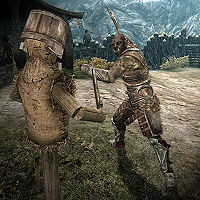 He wears a set of steel armor, excluding the helmet, and wields a steel war axe. He carries the key to the longhouse, a piece of food and selection of common items and gold. When you approach him he may comment, "We honor the bravest fighters, but I have seen many types of bravery in my travels." and "I am an Orc and a warrior, but I have no desire to become chief." When you initiate conversation, he will admit: "I used to wander the corners of Skyrim like you. I miss those days." He goes on to say: "I do. There is a freedom the roads give you that the stronghold does not. But I have a place here, and I wouldn't want to dishonor my clan by leaving again like some young pup." When asked about his daily routines in the stronghold, he says, "Me? I'm Burguk's brother. I came back after serving many years in the Legion. By then, Burguk had already become chief, and he welcomed me home as family, not a rival as is tradition." When asked about his years with the Legion, he says: "I did. I was known as Ghorbash gro-Dushnikh in those days, in honor of my homeland. Many Orcs leave the stronghold to join the Legion. They welcome our skill in battle and smithing, and we welcome a chance to see the world." Obviously, Ghorbash is interested in more adventuring but if you ask him directly to come with you, he will say, "I couldn't. It would dishonor the place the chief has made for me." You must pass an easy Speech check to persuade or bribe him, or you can challenge him to a brawl. You just told me you missed adventure. (Persuade) Passed: You're right. Look at me, talking in circles like some old wise woman. Very well, outlander. You have my axe when you need it. Some coin, to soothe your guilt? (Bribe) Passed: Well, for that much, I don't think Malacath would turn his scowl on me. All right, outlander. My axe is yours. Too frightened to leave home? Ghorbash was supposed to have conversations with his brother Oglub, but they will never meet, making the recorded dialogue unused. He was incorrectly classed as a ranger (which focuses on archery), instead of a 1H warrior which his equipment selection strongly supports. This page was last modified on 2 April 2019, at 19:30.